#2 Laima Chocolate Museum – A must-see for chocolate lovers. The Laima Chocolate Museum offers a sweet adventure looking into how chocolate is made in Latvia’s most popular confectionery. You can also fill your stomach with free chocolate tasting and workshops for kids and adults. Although the museum is rather small, it is very cosy and the chocolatey smell and warm, cosy atmosphere will make you stay for an hour or two if not more. A very cool feature is that you can make your own chocolate package, which makes a perfect gift for your friends or family. This museum is a wonderful venue for couples on a date, as well as for getting together with friends and families with kids. #3 National Museum of Art – Host of the largest collection of national art in Latvia. 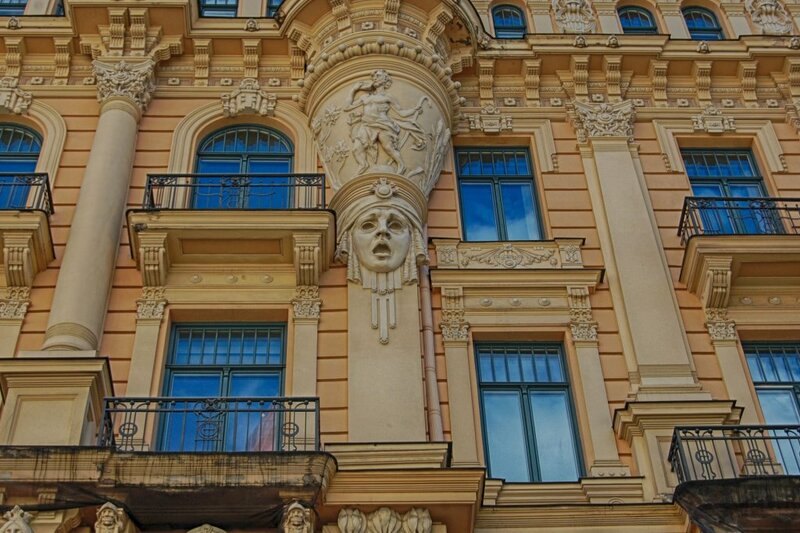 Dating back to the early-1900s, this historic building is a fine example of the Baroque style in Riga. The largest collection of Latvian art can be found here, including examples from the late-18th to the 21st centuries. My friends and I especially enjoyed the period between 1880-1915. The museum also offers fascinating insights into Latvian life and culture over the last 300 years. The museum also has a lovely souvenir shop and a restaurant perfect for brunch or lunch after a morning of soaking in the art. #4 Riga Motor Museum – A modern interactive museum featuring retro cars and motor history. If you love retro cars, this place definitely must be on your checklist. Three floors house a great collection of cars including vintage vehicles and legendary race cars. The cars – and more than a hundred interactive screens – will keep you busy for hours. It is also worth mentioning that Riga Motormuseum was among the Top 10 finalists for the 2017 European Museum academy awards. #5 Aldaris Beer Museum – For the beer enthusiast. 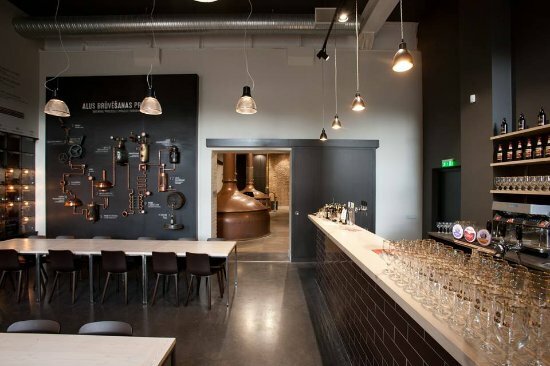 Aldaris is the very first beer brewery in Latvia and since 2015 it also hosts a beer museum in the separate wing of the same historic building, where the most exclusive beers of Aldaris are brewed every day. Here you can not only learn about beer brewing history but also indulge in a classy beer tasting experience. The exhibition answers typical questions such as, what is the difference between ale and lager. You will also get acquainted with the periodic table of the most popular 55 beer varieties of the world. Did you know it existed? 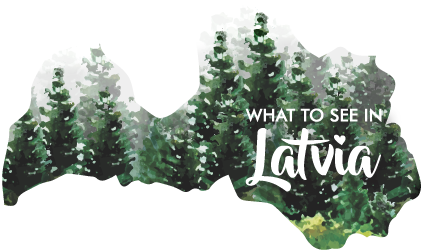 🙂 You will have the chance to discover the diversity and charm of beers brewed in Latvia, the secrets of brewing, and you can even try a hand at brewing yourself. Aldaris Beer Museum also offers a 2-hour beer tasting and food pairing class called “Masterclass for beer connoisseurs” which will guarantee a lot of fun and will teach you how to pair your beverage with food correctly, similar to wine tasting classes. It’s a bit on the pricey side – 200 EUR for a group – but if you are a group of 10, then 20 EUR per person would totally be worth it. #6 Riga Porcelain museum – For those who are into ceramics and porcelain. I recommend this for those who appreciate fine porcelain and great craftsmanship. Riga has a centre for fine porcelain manufacturing since the 1800’s and this lovely, small museum hosts a collection of fine pieces of porcelain. Truly beautiful items. It’s worth mentioning that they offer a porcelain workshop, where you can buy an item (such as a plate, bowl, little statue) and paint it. Then they bake it and you are ready to take it home. Tourists say that Latvian porcelain is unique, one of a kind, and not like the porcelain of many other countries that have been influenced by French and Chinese porcelain. The museum is worth a quick visit, taking only 30 minutes to an hour to tour. The staff are very friendly and can tell you about each of the pieces in the museum. Free entrance for Riga Card holders. Located in Kalēju iela 9/11, Rīga. #7 KGB house – Also known as, The Haunted House. If you are looking for a more thrilling experience than indulging in chocolate-making or looking at porcelain cups, perhaps in search of a more dark and thrilling adventure, I have a suggestion for you: the so-called Corner House. Here you’ll get a chilling insight into the dark days of Latvia’s past, when it was a part of Soviet Union. To be honest, it was quite emotional for me to visit this place as a Latvian, but one has to know one’s own history. When Riga came under Soviet Union control in 1940, the brutal new leaders brought with them the dreaded KGB or secret police, who had the power to imprison people for no good reason or any reason. Many of the people captured by the feared KGB were executed in a killing area in the basement of the Corner House, while others were held captive in the cells. Many people knew what the KGB Corner House was used for and where the people that went missing were, but everyone was too afraid to talk about it in case they too would be killed or imprisoned in the Corner House, never to be seen again. My parents told me that during this period one couldn’t trust anybody as there were spies everywhere. We booked a guided tour in English, which helped us fully understand what went on in this terrible place. The whole thing gave me the chills, but I can strongly recommend a visit to the Corner House. A guided tour costs 5 EUR. Thank you for reading and as always, stay tuned. Soon I will publish another article about museums outside of Riga that are definitely worth a visit.